Have you have ever tried to finance a mobile home manufactured before 1976? You probably felt like it would be easier to sell snow cones in Antarctica! Fortunately owner financing and private mortgages offer creative alternatives for hard to finance mobile homes. When purchasing a new mobile home financing is often offered through the dealer or retailers. Approved Federal Housing Administration (FHA) lenders are an option for mobile homes that meet the guidelines, including the age restriction of built on or after June 1976. Manufactured homes permanently attached to a foundation also have access to financing as a mobile and land package, provided credit and equity are acceptable. A private investor, independent bank, or credit union may provide alternative financing options. These are generally local investors or in-house portfolio lenders that are familiar with the area and comfortable with the risk at a lower investment exposure in exchange for a higher rate of return. Asking the seller to carry back a note is a common way to finance the purchase of a mobile home. The owner acts as the bank by accepting payments from the buyer over time. This avoids meeting the more restrictive bank mortgage requirements. While interest rates are likely higher with owner financing it can provide a viable solution allowing the buyer to take advantage of the affordable housing mobile homes offer. Some sellers prefer a lump sum of cash today and are reluctant to collect payments over time with owner financing. If a seller prefers cash now they can consider temporary seller financing and then sell all or part of the payments for cash to a note investor on the secondary market. Manufactured homes make up an average of 8% of all home sales according to the US Census Bureau. There are some states, like North and South Carolina, where that percentage nears 18%. Many of the states with mobile home sales over 10% are also the same states that rank higher for overall owner financing. This just proves what most note buyers and note brokers have known for years. When there are properties or buyers that are hard to finance people turn to owner financing. Author: Tracy Z. Rewey has been making money full time with owner financing for over 20 years. I have a 1973 mobile home on 3 acres in Northern California I own outright. I would like to get a home improvement loan. Any ideas? Thank you! Hi Tracy, I’ve identified a home I’d like to purchase, it’s a manufactured a-frame on 8.5 acres in Michigan, but it was built in 1972. The listing only states Cash or Conventional Loan as payment options. It’s been up for over 200 days. I’ve prequalified for an FHA loan 3x the amount of this home, and have a great debt to income ratio and a credit score in the low 700s. I’ve spoken with a mortgage broker and she basically told me that no one will finance this loan. As there will be renovations I’ll want to do on day one, I’d like to keep some money reserves and only put down 5-10%. Is my best bet to see if the owner will do Owner Financing or through a private investor? Who’s the best person to connect with-a realtor or real estate attorney? Hello Candace, You might be able to find a lender that would treat the loan as land depending on the value without the mobile home. The owner financing route can definitely be a good option. You will want to get title insurance and close through either the title company or an attorney (whatever is customary in your area). If you are trying to find private investors in your area you can locate the local chapter of the National Real Estate Investors Association. Or look for ads in your area that say they Buy houses or buy real estate notes. FYI most private investors are going to want to see a bit more down (15-20%) to feel good about a new note on harder to finance property. You have to keep in mind that private lenders aren’t protected by PMI for the 80%+ LTVs like traditional lenders. Thanks so much for the prompt reply, Tracy! I think I’d like to see if the seller would entertain an Owner Financing option as the next step. Can you recommend the best way to make that proposal? Should I just do a generic outreach through their relator, or engage with a relator of my own or a real estate attorney first to come up with a specific proposal to present to the buyer? I am looking for a private lender. I own a 1995 16 by 80 mh out right with clear title. I wanting to buy a lot which has all utilities to lot, I want the mh perm. affixed to land. All ive been is scammed out of a lot of money. Cant find anyone to loan on a mh then cant find anyone to loan on land without a high fico score. I am selling our mobile home for $25,000 and found seemingly trustworthy buyers who say they need about 2 months to qualify for a personal loan for the purchase amount and want to pay monthly payments until they can pay in full. What type of sales documents to I need to prepare to do this? It has 2full bathrooms and is in good condition with a asking price of $5000 obo. I did floors and construction for over 30 year’s, the year’s of hard labor disabled me, but I still have the skills nessasary to bring the value far above asking price. it’s good and getting better. What are my options, are there any programs available for the disabled. Hello William, Your best options for financing on that age and condition of mobile home is to ask the seller to carry financing. Start by deciding what kind of down payment and monthly payment you can afford and then back into the numbers (note amount, interest rate, and term) from there. Try to make the offer attractive to the seller but affordable for you. I have a 2010 palm harbor double wide home that is still financed through 21st mortgage and I want to sell it. What is the best route to go about selling it? Can 21st mortgage just transfer the loan to the buyers name or what steps do I need to take? Have a 1969 double-wide mobile home. Some home improvements in the home + a new roof. Has a double car garage. Situated on a large lot in Northern Ca. Paid $85,000 owe $39,000. Interest is 7%. Is there any place that will refinance my property and lower my interest rate. Thank-you. my family is trying to sell 9 acres in coastal northern California, the property has 2 homes and one 42 year old mobile home, I have been told that you cant get financing on this property. is that true even though there are two other homes that are not mobile homes? A conventional lender will most likely not include any value for the mobile home in regards to the loan to value (LTV) amount that they would be willing to lend on for a buyer. A mobile is usually required to be 20 years old or less to he even considered by a portfolio lender. With the other 2 homes, it can be bank financed with a larger down payment to make up the difference of sakes price and the amount that the bank will finance. If the property is still available please let me know as I am interested. I’m trying to buy a 1979 double wide in a 55+ park the owner asked $19,000 I need find someone else who can give me a loan, the property is in a excellent condition. You could ask the seller to carry back a note. The other option is to locate a local private investor that specializes in mobile homes. There was a post from Melissa (a reader here in the comments) that mentioned 21st Mortgage as a possibility for older mobile home loans. We are trying to purchase 1995 doublewide on 3 acres. It is a repo so bank owns it. Actually fanny Mae out of Dallas owns it. Will not do loan on it. Is there any other way we can get this place? You might look at contacting a private investor in your area to see if they would purchase for cash and then sell to you with owner financing or perhaps they would lend you the funds to purchase if repayment is secured by the mobile and land. Try searching the term real estate investors along with your city. There is usually a local REI Club. 21st Mortgage will do it! We bought a single wide that was 20 years old on 1 ac for $30K and they did the loan. They were wonderful and we had no problem. ..how can we refi to pay bills, or how do we sell. When I purchased this, I had no idea of these regulations, as it was conventionally financed! Any advice appreciated. Hello Diane, How very frustrating. You might try another lender or credit union that has a local presence. A private investor or private lender might also be an option. You can usually find these in your area by searching online for a Real Estate Investor Club in your city or county. Call the local mobile home dealers to see if they know options for financing the older mobiles. If you are selling the property then providing owner financing is also an option (but that doesn’t help right now if your intent is to refinance). Hope that helps! We have a 2001 Double wide set on an engineered foundation and on 9.9 acres that we have had on the market. We had some recent buyers back out. We obtained all the documentation they had since they had pursed a FHA loan. We appraised at $175k and have it on the market at $135k. I have been considering owner financing it. If I owner finance at 135k at say 8% what would be the likely return on selling the note that an investor. The investors that we work with purchase the seller financed notes at a discount (rather then make loans). You might consider asking the seller of the mobile home to provide owner financing to facilitate your purchase. Send me an e-mail. We have done many loans just like what you are seeking. I’m not sure where to email you but if you do loans for mobile homes, I’d love to talk to you. I am very interested in what you have to offer. I am currently looking to purchase a mobile home for an astounding price, and it’s amenities and condition are wonderful! As a single mom of 3 daughters, I want something affordable. My income is more than plenty to acheive this!! I’m selling my 1986 double wide manufactured home with owner finance and I’m trying to figure out how much interest I should charge. They are financing about 30,000 and putting $25,000 down. I called the local bank and they would give a 10 year 7.75% interest. I know I should get a better rate than them, but how much? I am a mobile home investor. We rehab, then sell as rent-to-own. I want to look at owner finacning my mobile homes. Would you have any resources you could share as to what I need to be able to do this? I know I will need a promissory note, but do you know where I can get one for personal property (MH’s)? I also know that the lien is recorded on the back of the title at the DMV. Are there other ways the lien must be recorded? What about the ins and outs of repossesion? All great questions Steve! Our course is primarily geared towards mobile homes that also include land. Of course many times the mobile home is still titled so you have to go through the process with the DMV (personal property) and the county (real property) to perfect the lien. It can also vary by the state you are in. There are samples of the mobile/land deals in the Finding Cash Flow Notes Training. There are also a couple of good resources out there on investing in mobile homes only. One that comes to mind is by Lonnie Scruggs. Sadly, he is now deceased but to my knowledge his books are still available. I purchased a 1967 trailer with a large addition on it almost seven years ago. It doesn’t even really look like a trailer when you look at it from the road. It also has a two+ car garage attached to it. I have a buyer lined up for it, but we cannot find finanancing ANYWHERE. Everywhere has ONE stipulation that we can’t meet – either the HUD sticker is missing (since there ISN’T one due to its age, I can’t meet that) or the foundation that it’s on isn’t the kind that they want (it’s on piers.) I’m at my wit’s end – even then lenders that I go through now that carry the mortgage will not finance it. My realtor and myself have exhausted pretty much every local lender that we can think of and then some. Any help would be greatly appreciated! With older mobile homes you may need to consider offering seller financing. You could also look for investors that advertise they buy mobile homes for cash and see if they might buy and then provide the financing. Networking with a local real estate investor club can also help you find a private investor willing to provide the financing or buy a seller financed note after closing. If you decide to offer financing be sure to consult with an attorney and consider the buyer’s credit rating, income/expenses, down payment funds, and other important underwriting factors. Hope that helps and thanks for reading and commenting at NoteInvestor.com! We are senior citizens (in our seventies) wishing to purchase an older mobile home w/land (in a senior park). Problem is, older MH financing is almost non-existent: Our (both) income is derived from SSA, but are needs are small and so we would be able to handle a reasonable monthly payment. What to do? With older mobile homes your best option is to ask the seller to finance the property for you using the installment method. You could also look for investors that advertise they buy mobile homes for cash and see if they might buy and then provide the financing. Networking with a local real estate investor club can also help you find a private investor willing to provide the financing. If you have a package put together that includes your credit rating, income/expenses, down payment funds, and background information it will help convince either the seller or an investor you are a good candidate for seller financing. My boyfriend and I are house-shopping and recently found a home we absolutely love. It looks nothing like a mobile home, but apparently it started out as one. So half of it is still a mobile home (although it’s been redone completely) and the other half is not mobile home materials. I have two questions for you. 1) Is there any way of getting a home reclassified so that it’s no long considered a mobile home? This home looks nothing like it and the only remnant of mobile home construction is the steel frame that is under half of it. 2) Is it a huge financial risk to purchase a home like this? Our realtor said it was… because if you decide to sell it sometime in the future, it would be that much older and that much harder to finance. Is that true? Hello Carrie! We have bought quite a few seller financed notes on the kind of property you described. Mobile homes can be an affordable housing option in many areas. However, they come with some caveats. Your real estate agent is being honest in bringing them to your attention. Properties classified as mobile homes have a hard time holding their value and tend to depreciate rather than appreciate. They are also harder to get financing on, which is part of the reason we see so many being owner financed. There are sometimes ways to have a mobile home reclassified as real estate if they are permanently attached to the property and meet certain qualification – However, this differs state by state. I suggest speaking with your real estate agent, a local title company, and/or an attorney in you area for how it works in your state. 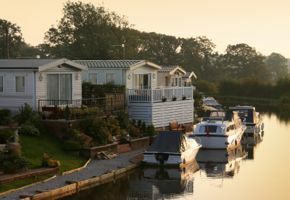 Whether buying a mobile home makes sense for you is a personal decision but it is good that you are becoming knowledgeable and weighing the risks. I’m selling my mobile in Prescott valley. I’ve got an offer but I have to carry the note. Can you help me out here?? My daughter has a 1985 mobile home with a full, stem to stern, two-bedroom, living room attachement built onto it. She is currently financed with Tower Loan, in West Monroe, Louisiana, paying an almost 28% interest rate, which she’s been paying for eight years! She wants to do some additonal work to her home, but Tower Loan isn’t cooperating. Is there anywhere she can go for refinancing, at a lower rate? It is hard to get financing on older mobile homes, especially if someone is looking for cash out of the refinance. A local private investor might refinance the note depending on the equity and credit. Your local real estate investor club is a good place to locate private investors for this type of deal.